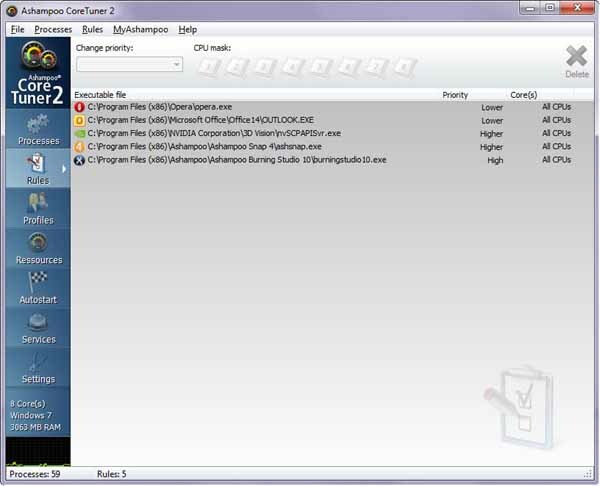 Free download Ashampoo Core Tuner Latest Version. Ashampoo Core Tuner enables you to use the complete power of your processor in the best possible way, while it hardly uses up any resources itself thanks to driver technology. The optimization of single processes can take place fully-automatic or manually. Furthermore, the new Live Tuner accelerates the start of new applications by instantly assigning all available resources, while the system is already working to full capacity. Optimal use and management of up to 8 core processors.Automatic as well as manual assignment of cores and priorities.Rule management with well-structured administration of all adjustments.Predefined basic profiles for the individual adjustment or easy use.Instant use of profiles with just a few clicks.Optimized start of applications by focused assignment of computing power.Management of autostart entries and services including ratings platform.Visual display of system capacity of all processor cores as well as single processes.New intuitive user interface.